Impressive. You’d never know I smoked a deer at 65 in a Veloster. Super easy to work with and really affordable. As one of the first customers of the new owners of University Collision, I was delighted to see the good-as-new fender in place of my white picket fence scrape that was beginning to rust out – absolutely new car factory finish. I continue to smile every time I get into my car. Thank you, Jesse & Marc. Worked a miracle on my boss’s Audi; it looks amazing!! Job well done guys! You detailed my messy car and it exceeded my expectations. I don’t think there was a corner or crack that went untouched. Well worth the money. Thanks! Thank you so much for a great job on my Honda! I will definitely recommend you guys in the future! Thanks again. You guys did an awesome job on my fender repair. I really appreciated that my car was washed and that the inside was clean too. It was a very nice surprise! You guys really go above and beyond. Wow! These guys do really great work! When I picked up my Tacoma, I wasn’t sure it was the same truck I dropped off–it looked even better than before I wrecked it! I really appreciate that they washed it and cleaned it out; it’s never looked so good. I was so impressed with their customer service. I know very little about cars, and Jesse and Marc took the time to talk me through everything–they are the nicest guys! I will be telling everyone I know about University Collision! I am really picky about who works on my rigs, but I could tell right away when I walked in the office for an estimate that Marc and Jesse really know their stuff and really cared about making sure everything was perfect on my truck. I’ll be back for sure! 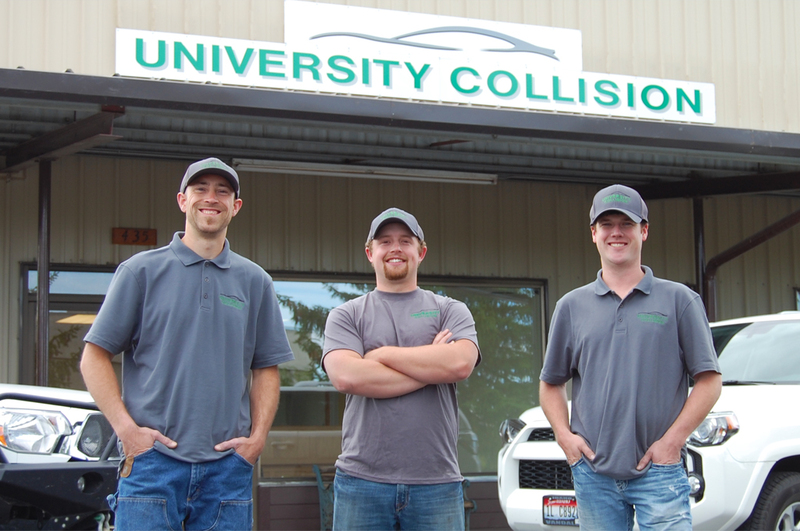 At University Collision of Moscow, Idaho & Pullman, Washington–we know cars, and estimates are free! When you walk in our door, you’ll get outstanding craftsmanship and outstanding customer service. We provide high quality auto body collision repair and paint; our technicians are highly qualified, certified, and genuinely care about earning your trust. We know that when our customers are looking for a collision repair shop, they want a shop that not only takes great care of their car, but of them as well. University Collision backs up all repair work with a written lifetime guarantee. If it isn’t right, we’ll make it right–free of charge–to bring you peace of mind and peace of wallet. © 2019 University Collision Auto Body Repair and Paint.